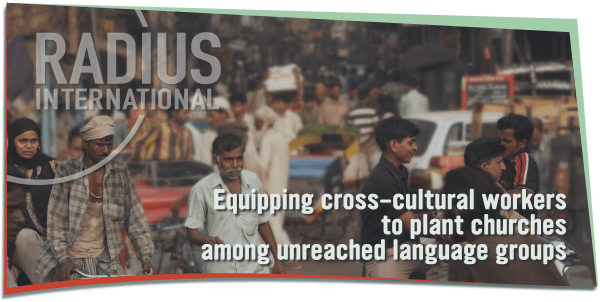 Radius International is committed to assisting the evangelical church and missions community by providing pre-field missionary training that will equip cross-cultural workers to achieve their objective of partnering with Jesus Christ to establish healthy, indigenous, reproducing churches among unreached people groups. We equip cross-cultural workers with the tools needed to be effective and avoid unnecessary attrition before the task is complete. US and Canadian churches can send their missionary candidate for pre-field training to our training center in Tijuana, MX. We believe you practice how you play, that is why our training is done in a cross-cultural context. Our students are learning in a hands-on environment. You cannot truly know one, without the other. Miss these and the gospel you share may not be the gospel at all. We teach our students how to acquire both language and culture so that when they share this message of life, it is understandable at an adult level. “I cannot think of a more thorough preparation for the mission field than spending eleven months at Radius International. Students at Radius receive sound teaching and are able to apply it in the community as they learn.